Rock Return | News and Features | Style Weekly - Richmond, VA local news, arts, and events. A rival radio station brings John Boy and Billy back to local airwaves. The classic-rock rivalry continues on FM. In the latest episode, Clear Channel’s The Planet 96.1 will start airing John Boy and Billy’s “The Big Show” tomorrow morning -- a syndicated show from North Carolina that was dumped last year by Summit Media Corp. Summit cut ties with John Boy and Billy at Rock 96.5 in November, replacing them with a locally based show, “Sam and Mason in the Morning.” It’s co-hosted by Sam Giles and his co-host, Mason, who’d been let go from Clear Channel’s XL102. At the time, Clear Channel Regional Operations Manager Dave Symonds said of the switch, “Maybe I shouldn’t say this, but I was a huge fan of John Boy and Billy and I kind of miss ’em.” Symonds says he’s been eager to bring the show back to Richmond. “When they were on 96.5 or whatever that station’s called, they outperformed the rest of the station,” Symonds says. But John Boy and Billy won’t have as big of a reach. Rock 96.5 is a 50,000-watt station while the Planet is a low-power station at 145 watts. Clear Channel’s more powerful rock station is XL102, which mixes newer rock with classic. 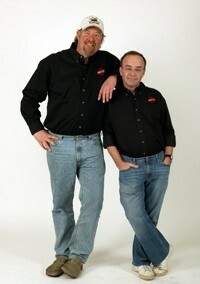 John Boy and Billy will air 6-10 a.m. Monday through Saturday on 96.1 The Planet.